What goes into spring cleaning in your walk in closet? Not too much if you have designed it correctly from the start! What do you want to need most from your closet? What do you need for built in storage? Do you want drawers, shelves & cabinets? Look at the space your clothing, jewelry, shoes etc take up now, and add to that space for new items. 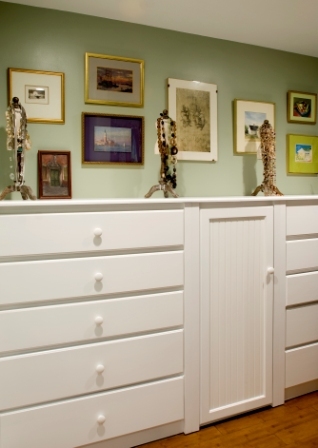 In the example above they wanted lots of drawers and 1 cabinet. They did not want to see any clothes. What do you want for hanging space? Split rods for shirts and pants, and longer space for dresses and coats? How much of each do you need? You may not have many long items but you have a lot of skirts, pants and shirts, so you need to base your hanging storage on your needs! Do you need a space to sit in the room, or a vanity area? What is the feel you want the space to have? The space above was a coastal home where they wanted to be surrounded by art and photos. So we set up a gallery above the built-ins to display their collections. Do you need a full length mirror? If so where do you want it? Do you need storage for an ironing board and iron? Or do you send everything to the dry cleaners? Once you have these questions answered your closet design will come together! If you have designed your walk in closet space well, you just need to pick items up off the floor and surfaces and dust & vacuum to do your spring cleaning!